Still on schedule….knock on wood!! A lot has happened in the past 30 days. Thanks for the comments and feedback – we LOVE hearing from you – comments of all kinds! After a big push, the 2nd floor is ready to cast. While the beams are tied on the ground, the guys form up the floor with channels that the beams will be set in, then 2X4’s go in to support the plywood for the floor. The 2X4’s are supported underneath with bush sticks, cut to the exact size the floor needs to be level. As soon as the bush sticks are set, the steel grid that ties the beams and floor together are set in and tied. 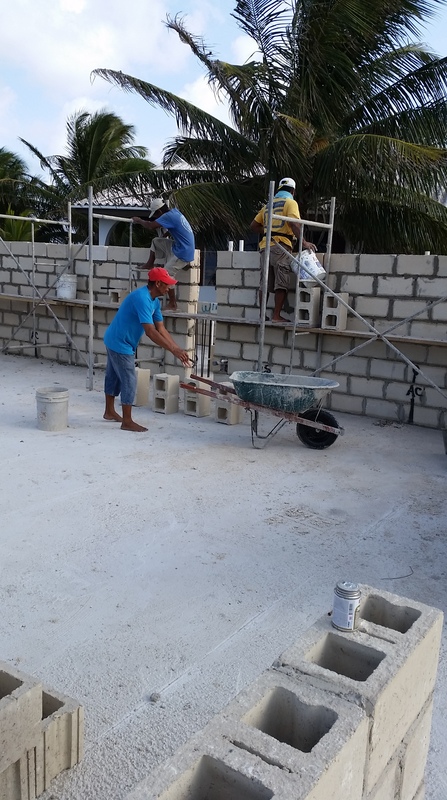 Juan Diaz and his sons come in for a day and a half to set the electrical and plumbing that will be covered by the cement, thus permanently becoming a part of the building. The plumbing is pressure tested to make sure we have no leaks. We are right on schedule for a cast on Friday! Omar and I had crunched the numbers and decided to use “maquinas” or machines to help with this pour. It’s frowned upon on the island to use machines because it replaces men that go around the island and contract cement work for a day’s pay. The guys literally follow the cement mixers around knowing that where ever it stops, there will be a pour there very soon. We decided to use machines because we are on the 2nd floor and would need around 35 men for a bucket brigade, plus as many as 3 cement mixers. Financially (and theoretically) it would save some money and men’s backs, to use the machines. We contracted with a local guy who owns a mobile batch plant and a cement pump. It is the only one of its kind on the island. is loaded (10 yards of cement mix, 70 bags of cement and 300 gallons of water). The plant mixes the cement and augers it over to the pump which pumps it through a fat hose to the roof where we are casting. They fire it up and hit the hydraulics to start the auger and “POW” hydraulic fluid everywhere and no auger moving. Evidently, they didn’t clean the auger out the day before, so the cement they poured, became concrete overnight. The next 3 days of incompetence was like none I’ve seen before. What I saw for the next 3 days is below. The only difference was that on Saturday and Sunday they had different clothes on. They came back on Saturday at 7:00 am and we called it off at 7:45 am (again) and decided to shoot for Monday. The “mechanics”, who were STILL working on the hydraulics on Sunday at 3:00 pm, said when they took it apart, they couldn’t remember how to put it back together again. I told them politely (hmmmm?) to get that machine off my land. We poured the floor using cement mixers. We dug a hole in the ground, lowered the pump into the hole, then built a ramp up to it. We brought in a 2nd cement mixer and crew, then a 3rd around 1:00 pm. Using two wheel-barrows per mixer, men took the cement up the ramp and poured it into the pump. It took three days (only one after we finally got started! ), 37 men, 3 mixers, over 90 yards of sand/gravel mix, 440 bags of cement and 25 “I told you so’s”, but at 6:30 pm Monday night, just as the sun was setting, NIGHTMARE OVER! The next morning as the sun comes up….ahhhh, how sweet the victory! AND, we still see over 60 psi on the plumbing! Now we get back to business as usual. The guys start stripping the side forms and start hauling up block for the 2nd floor. The week flies by with the guys getting almost all the walls set and some form work for window and door lintels. We can really start to see the 2nd floor take shape! but new guy Gasper and everyone else pitches in to make it all come together. In this photo (left), you can see a temporary hoist Walter built to get the blocks to the 2nd floor. One by one, block after block, they come up using a heavy pulley, rope and MAN POWER. They also use this hoist to lift buckets of cement when they pour the lintels, doors frames and columns. LOT’S of hoisting – ALL DAY LONG! then the stairs, then the steel. He is in command when the cement starts flowing and he calls for the right consistency. Too wet and it all flows to the bottom. To dry and it will be honey combed. He does it ALL and it comes out SPECTACULAR!!! It will end up being a show-piece for the place!! 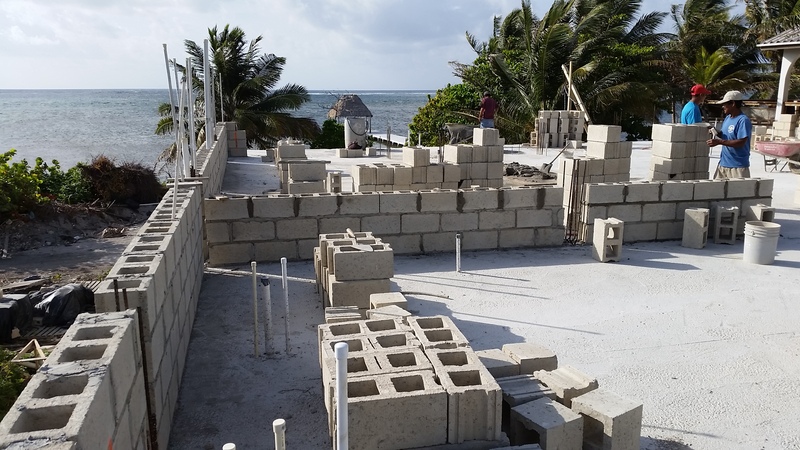 Within a few weeks, the walls are locked in place and the columns, door and window lintels are done. The plumbing and electrical crew is busy on the first floor, but spending a lot of time on the 2nd floor also – making sure outlets, kitchen appliance connections, plumbing and everything else is solidly in place. It HAS to be done before we can start forming up for the 3rd and final floor. Juan Diaz reminds me daily that it’s a lot easier to make changes now, then to go back and change later! So far we have been on schedule – just as Omar laid it out before we started. To stay on schedule, Omar lets me know that we need to contract out the plaster work. This is the coats of cement that go over the block to finish the wall systems. By contracting the plaster out, our crew will be able to advance on the 2nd floor, while another crew advances on the 1st floor (plaster). By contracting the plaster work, we can also control the costs. The plaster guys get a set amount per square yard or foot of plastering. They know, and we know, how many square feet there is total, so they can work at their own pace. We monitor the quality of the work, so as long as the work gets done correctly and in a timely fashion, everyone is happy. We hire a GREAT plaster crew and let them go to work. It looks like by the end of week 4, the first floor plaster should be DONE. At this point, we now have our main 12-man crew, a 4-man plaster crew, and 2 or 3 plumbers/electricians on site everyday. We lost a few of our original crew, but added some great talent as well On top of that, we have suppliers stopping by weekly to make sure we are on schedule with lighting and plumbing supplies, lumber for cabinets, tiles and the like. When I say it’s a busy site, you should believe it! We’re hopping now, baby! It’s not too long af ter the 2nd floor is cast that we start framing up the 3rd and final floor. One crew framing and a 2nd crew on the ground, tying and cutting the steel. We eliminated a column that would have come down in the center of the kitchen so the overhead beam is MASSIVE. But Pinky (Victor) is on the job and it’s no problemo!!! We use a lot of ($$$) 5/8″ steel, tied with 1/2″ steel and we increase the size of the beam to 21 inches. Truly it’s massive! The picture to the left doesn’t do it justice! Mercifully, the 3rd floor is only about 25% concrete, which will become the rooftop entertainment area and unbelievable 360 degree view! The remainder of the 3rd floor will be roofing. This means that we are VERY close to getting this thing under-roof! Critical because rainy season is quickly approaching. If we get this under roof, before rainy season, we will have plenty of work to do inside when it rains. We’ll also be able to catch the rain-water and start filling up that 50,000 gallon cistern we talked about in the first blog. After the framing is done, the bush sticks come back up to support the beams. Then framing for the floor with 2X4’s and plywood (again). We’re finally ready to pour the 3rd floor. THIS TIME, we’re smarter and we hire labor, build a scaffold and start the pour on-schedule. NO B.S. this time around!!! We use 15 extra guys, 36 yards of cement/sand mix, 160 bags of cement and about 40 5-gallon buckets. We start the pour at 9:00 am and finish at 6:30 pm. A long, hard day on these guys. As they’re leaving and getting paid, I’m thanking them and asking if they’re all right. I can see how tough it is on them. Never a complaint. I only hear, “Mui bueno”. This is just another day for them, but I’m exhausted just watching them! Seemingly overnight!!! We have a long way to go, but we’re on schedule and on budget right now!!! When the craziness was happening with the 2nd floor pour, the many long days and nights worrying about all the small things that go into a project like this, it’s sometimes hard to see the vision through the chaos. Sometimes those bad thoughts creep in that maybe this wasn’t a good decision. Maybe we’re in over our heads. Fortunately, when one of us has been down and out, it always seems like the other one is there with a smile and words of encouragement. It’s enough to keep going and it’s the inspiration it takes to push on. If anyone thinks they can do this on their own, think again. It takes two very strong minded partners to keep it going. In the end, it is truly inspiring to look back at what happened that day or week or month and see the real progress towards the goal. We have a long way to go…but we’re getting there!!! We appreciate your support, thoughts and comments. As always, please feel free to comment or subscribe to this blog. Also, please like and share us on Facebook at Twisted Palm Villas so that you’ll continue to get our updates. Thank you for taking the time to tune in to what we’re doing. We also hope that it inspires you to go after whatever it is that you dream about!!! Mike/Laura – Awesome update as usual! Place is really come together and taking shape. How do you know so much about all the construction stuff … Like bush sticks, size of steel, etc? Also, how do they not get burned from having that cement on them (no gloves and no shoes)? I love how they are so dedicated and grateful for back-breaking work and no complaints at all!!!! Do you pay the crew or do you pay Omar and he pays the crew? Do they get the weekend off? If so, do you? I love the spiral staircase! That will be an awesome feature! What is the target date for being completely finished and open for business? Our love to you both! Hi Mike. Thanks for the comments and good questions. I’m learning a lot as we go since I don’t have a lot of experience building with concrete (or building in a hurricane zone!) The plans we had drawn up by a local draftsman and then had an engineer look at them. We had to have an engineering stamp before being granted a building permit. The idea here was this. I could pay for hurricane insurance every year, or I could spend a little more and build it to withstand a hurricane. I chose the latter and the engineer had to sign off on it. At first, we had some struggles because the guys felt like we were using too much steel or too much concrete. They see it as spending $500 per piling cap…but I explained to them that I’m not spending an “extra” $500. The cap would have cost me say $370 to do it their way. I look at it like I spent an extra $130 (BZD) to save thousands over the next 20 years. I lost some of those battles, but won more. I’m going for the war-win, and can sacrifice a few battles along the way. When you live here, you see a lot of things (like bush-sticks and tying wire) in daily use at job sites. It’s all really just common sense. In the US, they’d use steel poles or jacks to support poured beams, but here, they pour them in place so it’s a little different. There’s no giant cranes to lift pre-cast beams or pilings…so they do it the old fashioned way – MAN POWER! I don’t know how the guys do a days work with no gloves, no shoes and just GUTS!!! But they do! The only complaint I heard was on the 2nd floor, I was scrambling to arrange lunch for 35 guys due to the delay, so I got fried chicken and fish sandwiches. The guys HATED the bread…they say that rice and beans stays with them longer – so, rice and beans it was for this last cast! No complaints. It’s really amazing and it’s what inspires me to keep writing about it. The people here don’t know how to complain. They find the good in everything. It’s raining…so “we needed the rain”. It’s hot, but “there’s a nice breeze”. It’s taught me a lot about myself and other people, too! My crew of 12 guys works M-F 7a to 5p and Sat 7a to noon. However, I have 3 guys that work on the crew from the mainland so they only go home every 2-3 weeks. On the weeks that they are here, they want to work Saturday afternoons and sometimes Sundays – which I pay them for the extra 1-1/2 days. I have been getting some flack from a neighbor though that she needs 1 day a week for Sabbath – so I’ve tried to curtail the Sunday (even though I’ve always considered Saturday to be the 7th day of rest???) As far as me…I’m there from 7a until everyone is gone (about 6p) including Saturdays – although I just check in with the guys Saturday afternoons and Sundays to make sure they have water, cokes or whatever. The weekend workers really don’t require much supervision…they are stallions, in my opinion! We’re still shooting for a January 1 opening, but would love to get it done by December 15. Finishing is the toughest thing, but I’m contracting out some of the special jobs like paint, maybe tiling, plaster work. So we’ll see. The bottom line is I do the homework to find out who is who on the island. Get rid of the dead weight quick and let the guys who specialize get the job done. Sorry for long winded answer, but enjoying a vodka and soursop juice before dinner and bed!! Hope all is well with you and Patty! And I hope you guys are planning a trip for this winter!!! Miss you both already!!! I’m so thrilled that everything is working out so fabulously for you two! I’m so excited to see the place when its finally finished and hope to be one of the first guests at Twisted Palms. Rachel and I have been talking about reuniting out there and think it would be pretty awesome to be there for the grand opening. I hope things continue to go smoothly for you, I look forward to seeing you both again. Keep fit and have fun, enjoy the sun and a Belikin for me! Outstanding efforts AND results ! and within budget is just as impressive. a far, far better gig already. Thanks David, I have a pretty good gig here, for sure! But I could still use that G&T – especially one of YOURS!!! Thank you for sharing your exciting adventure! Having doubts happen whether you are in beautiful Belize or Casper, WY. I can’t wait to see the finished product! Hi Cindy – thanks for following us. It’s been a great experience that I think everyone should have at least once in their lifetime! Stay tuned as we’re approaching the final stretch. It’s getting crazier each day as we start to see the finish line! L sends her best!